A fine floral machine embroidery design in freestanding lace. 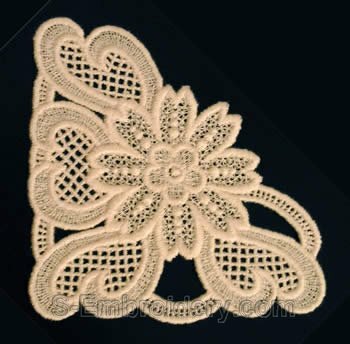 It is intended to be used mainly as a complement to the free standing lace square design offered as SKU 10221 Floral Freestanding Lace Doily. 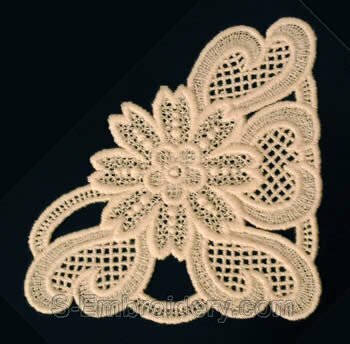 As shown on the detailed images below, it can be used together with the square design to produce a free standing lace doily of any size or independently to produce a smaller doily. This design is available and delivered also as a mirrored version. 2. The square freestanding lace design is NOT included and must be ordered separately.